Roughly 27 million Americans have been diagnosed with thyroid disease. There is a problem with that number though. Because of the symptoms a crazy thyroid can present, hypothyroidism, hyperthyroidism and other thyroid issues are commonly misdiagnosed. It is believed that somewhere between 13 and 16 million additional US residents suffer from a faulty thyroid, but have not been diagnosed, yikes! This is hardly a problem constricted to the United States. If you are a "modern" person, that means you eat too much processed foods, and are not active enough. This is not a knock on you as an individual, but rather a sign of the times. This causes your immune system to weaken and puts your thyroid health at risk, whether you live in the United States, the UK, Canada, Asia, Australia or anywhere else in the world. The term hypothyroidism was developed to define an under-active thyroid gland. Your body does not produce enough of the thyroid hormone to keep your many complex physiological processes running properly. This could develop over time because of radiation treatment, a surgical removal of your thyroid gland, autoimmune disease, food intolerances, hormonal imbalances, a nasty reaction to medicines, too much or too little iodine in your body or damage to your pituitary gland. Unfortunately, this condition can develop in infants, children and teens as well as adults, and in both men and women. No one is immune to possibly developing hypothyroidism. As you age your risk increases, and women are about 7 times more likely than men to develop some type of thyroid problem. Symptoms of hypothyroidism include extreme fatigue, depression, lack of emotional control, forgetfulness and mental fog, and weight gain. The opposite of hypothyroidism is hyperthyroidism. Your body releases too much of the thyroid hormone into your bloodstream. This too can cause health issues, such as weak muscles, unexplained weight loss, vision trouble, nervousness and irritability, and problems sleeping. Left untreated, or diagnosed and treated improperly, an unhealthy thyroid can have seriously negative repercussions for your heart. It can play havoc with a woman's fertility as well as your emotional stability. Your skin and hair health suffer, as will your cholesterol level and your ability to maintain a healthy body weight. High levels of chronic stress and anxiety often develop. Hypothyroidism can be treated naturally and holistically. Holistic approaches to healing recognize that your physical body, your mind and your emotional state are all interconnected. When 1 or more of these 3 parts of your identity is out of whack, this can cause problems in other areas. This is why a problem with your small but very important thyroid gland can lead to so many symptoms that are hard to trace back to an unhealthy thyroid. Fortunately, you don't have to subject yourself to the potentially dangerous and addictive medications and side effects which often characterize traditional medicine. Employ the following natural and holistic treatments and you can safely and quickly enjoy a healthy thyroid, and proper functioning of so many of the biological processes your thyroid influences. Did you know there are specific yoga poses you can use to treat and even prevent thyroid disease? Some of the compressing, stretching and twisting positions of specific yoga asanas actually massage your thyroid gland. This is like giving your thyroid a set of marching orders, instructing it to release healthy levels of thyroxin. This regulates a healthy metabolism level, which results in multiple body processes working properly. This is one of the most natural, holistic, simple to perform answers for treating hypothyroidism. There are also poses for treating hyperthyroidism, and even autoimmune diseases and conditions which negatively influence your thyroid gland. Use the following yoga asanas to keep your thyroid healthy and happy. You have in your possession the most powerful computer ever designed. I am speaking of course about the human brain. Meditation is no longer thought to be voodoo science, like it was looked upon as recently as the 1980s. Traditional doctors, medical care facilities, and health care providers are now embracing meditation as a way to improve the care they give their patients. Meditation can be used to lower your heart rate if it is unhealthy, you can meditate to lose weight, and achieve just about any other physical or mental breakthrough with this simple but incredibly powerful ancient Far East practice. Did you know that a lack of ability to speak up for yourself is associated with thyroid disease? Far East mystics thousands of years ago understood what we are just now learning to embrace in the West – the mind, body and spirit are all intimately connected, and influence each other. This is how hormones, which are related to your emotional behaviors and thoughts, can impact your physical performance, such as your ability to defend yourself verbally. This holistic perspective has led to a practice of meditation for benefits in the mind, spirit and body. Meditation is a simple practice that can be performed any time you have a few spare minutes of free time. You feel the spiritual, mental and physical benefits of meditation immediately. And you don't need to be a mystic or practice any particular religion to heal your thyroid through meditation. 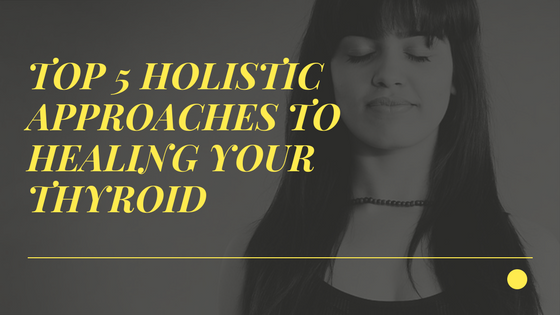 All you need to know is a specific meditative process and program that is designed to focus on thyroid health. What you will find is that certain meditation practices lend themselves better to achieving different desired results. Get the right thyroid meditation program or system in your hands, and unleashing the incredible power of your body/spirit/mind connection can result in positive change in your thyroid health, and in all other areas of your life. Ayurveda is sometimes referred to as the oldest health care system in the world. It is basically a traditional Hindu system of medicine. It is based on the idea of balancing your bodily systems, your mind, body and spirit, by using diet, herbal treatments and yogic breathing. It is the perfect complement to yoga to treat thyroid problems, and to keep them from developing in the first place. Follow the nutrition advice mentioned earlier, and make sure you add the following Ayurvedic-approved herbs to your diet for maximum thyroid health. A combination of Kanchanara and Guggulu makes for a powerfully effective Ayurvedic thyroid treatment. Ashwagandha, Bacopa, Black Walnut, Bladderwrack, Bugleweed and Echinacea are a few other natural herbs and plants that can boost your thyroid health. Consider these facts. In 1970 in the United States, 25.9% of all money spent spent on eating took place away from home. By 2012 that number had increased by an amazing 65%, as $43 out of every $100 spent on food was dedicated to dining out. That number is estimated at 45% to 50% of every dollar spent on eating in 2016. Processed foods make up at least 70% of all the foods in your grocery store. This means you can randomly choose 10 items at your favorite grocer, and 7 or more of those would be chock full of added sugars, not to mention extremely high levels of salt, dangerous toxins like monosodium glutamate (MSG), man-made chemicals, poisons, flavorings, steroids and other ingredients harmful to the human body. Pull into a fast food joint and you are basically giving that business permission to poison your body and negatively impact your health. The food and beverages you eat and drink are responsible for as much as 2/3 to 3/4 of your health and wellness. It sounds like an old cliché, but you truly "are what you eat". This should be wonderful news. In almost every daily situation you have total control over what you eat and drink. Since this is the case, simply by changing the way you look at food, you can enjoy maximum mental, physical and emotional health. 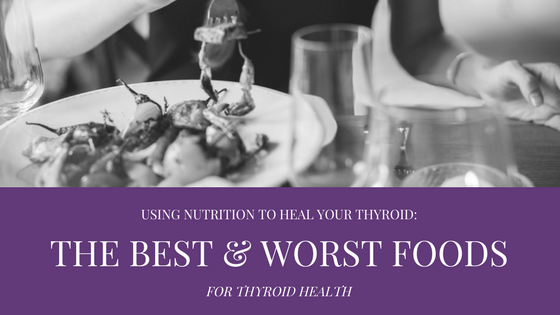 For healing hypothyroidism, and so many other serious and non-serious health problems, eating smart is the biggest and simplest step you can take in the right direction. The following approaches to eating for a healthy thyroid can slow down the symptoms and effects of hypothyroidism, and in many cases remove this condition entirely. Cut back or eliminate your caffeine intake. This may at first seem like an absolute deal-breaker for you. If you are that morning coffee person that cannot exist without your cup (or cups) of Joe, you may be unconsciously shaking your head while you read this holistic hypothyroidism treatment advice. Guess what? Your addiction to caffeine developed over time. It can also be erased over time. Caffeine is not inherently bad for you. Too much caffeine is. Especially when combined with the physical and mental health nightmare discussed in the next natural thyroid treatment tip, too much caffeine can be a killer. Seriously, you are probably eating way too much refined sugar, whether you know it or not. I know you are probably saying right now. "I almost never add sugar to the foods and beverages that I eat and drink!" That may be true. However, along with salt, added sugar is one of the most prevalent ingredients on the average food label, and is often disguised by confusing names like dextrose, maltose, barley malt, high fructose corn syrup, malt syrup and rice syrup. Remember, this is the upper limit of what is deemed healthy. The typical American wolfs down 20 to 25 teaspoons (85 to 105 g) of refined sugar each and every day. That excess 66 pounds of sugar in a year is what leads to conditions like hypothyroidism, as well as the overweight and obesity epidemic that is problematic for all modern nations, not just the US. "Rewarding" yourself with just a single canned soda means anywhere from 10 to 14 teaspoons of added sugar is entering your body. That is 110% to 350% of your daily allowance in one 12 ounce serving! Cutting back on foods that contain added sugar, as well as limiting how much sugar you add to your foods and beverages, makes sense for so many mental and physical health reasons. Say no to white flour. White flour is a refined carbohydrate. It is also known as a "simple" carbohydrate. Your body treats simple carbohydrates like sugar. Since the chemical makeup of white flour is very simple, it is absorbed into your bloodstream quickly. And since it cannot be processed before it is absorbed, it ends up getting stored in your body like fat. The same is true with many other flours and grain-based carbohydrates. Get more protein in your diet. Proteins have been referred to as the "building blocks of life". There is a very good reason for this nickname. Every single cell in your body needs and contains protein. It cannot be overstated that you should be eating plenty of healthy protein sources. This leads to the obvious question, "How much protein should you be consuming every day?" Most experts agree you should be taking in 0.8 grams of protein per kilogram of body weight (0.36 grams per pound). If you weigh 150 pounds, you should get about 52 g of protein daily. A 180 pound person would be shooting for roughly 62 g of protein each day. If you are an athlete, a bodybuilder or extremely active, you need 10% to 20% more protein. Eat some protein at every meal. This helps normalize your thyroid function. Proteins can come from healthy animal-based foods like grass-fed meats, organic chicken and eggs, and wild-caught salmon. Walnuts, almonds and cashews, nut butters and quinoa are also high in protein. Edamame, tempeh, beans and lentils, almonds, chia and pumpkin seeds, spinach, avocado and broccoli sprouts are other natural sources of protein. Start eating more healthy fats. The idea that eating fat can make you fat is ridiculous. That's like saying eating a hot dog will turn you into a hot dog. Hot dogs are obviously incredibly unhealthy, but you get the picture. Eating too much sugar is what makes you fat. Some natural, healthy fats include extra-virgin olive oil, grass-fed ghee, nuts and nut butters, flax seeds, avocados, coconuts, coconut water and coconut milk. Wild-caught fish, especially salmon, is also high in healthy fats, and the thyroid-friendly protein mentioned earlier. When you strengthen your immune system, you raise your defense system against thyroid disorders. A healthy immune system also improves your ability to fight off any infection or disease. Glutathione is a wonderful antioxidant that naturally makes your immune system stronger. If you experience an autoimmune flare up or currently suffer from an autoimmune disease, high levels of glutathione in your diet keep this from affecting your thyroid. These powerful antioxidants also heal thyroid tissue which has been damaged. What foods contain glutathione? Eat more broccoli and peaches, avocado and spinach. Garlic, squash, grapefruit, asparagus and raw eggs also have high levels of glutathione. If you cut back on the simple carbohydrates like sugar mentioned earlier, you will automatically lower your carbohydrate consumption. Eating the protein-rich vegetables like spinach mentioned earlier will also help cut your carbs. Enjoying a healthy low-carb diet with lots of vegetables, healthy fats and smart protein choices is a great way to keep carb-overload from wrecking your thyroid health. There are all kinds of studies from around the world which show that most people don't drink enough water. This means eating foods with high water quantities as well. The human body requires approximately 1 gallon of water to be ingested each day just to function properly. Water is an amazing detoxing agent. As it passes through your system, it attaches itself to toxins and poisons and removes them from your body. Keep a water bottle or container with you wherever you go, and sip water throughout the day. Aside from helping you regulate a healthy thyroid, this simple move will also keep you from overeating and gaining unwanted weight. Exercise is the perfect treatment for so many health conditions. Not just beneficial to the body, physical activity boosts brain health as well. When your brain notices that you are up and moving around, exerting your body, it releases endorphins and other "feel good" chemicals as a reward. This is why you feel so good, mentally alert and clear, after you exercise. That means that not only does your brain and body benefit from exercise, but your spirituality, your emotional state of being, does as well. Exercise does not have to mean running the Boston Marathon or lifting weights for hours in the gymnasium. The idea is to keep physically active as much as possible. Stand more than you sit. If you must watch television, do so while you are practicing yoga or enjoying some deep knee bends or some other type of physical activity. Walk when you can or bike, as opposed to driving. Fit physical human movement into your schedule each and every day. Specifically for thyroid health, exercise helps regulate your cholesterol level, and keeps your heart pumping healthy oxygen and blood throughout your body. This means a healthy regulation of your hormones, positively affecting your mood and emotions, as well as your thyroid and other important glands. One of the symptoms of hypothyroidism is a sluggish metabolism. Exercise boosts your metabolism immediately, and helps burn fat and calories for as much as 24 hours after your workout is over. Since joint aches and pains often accompany hypothyroidism, doctors recommend low-impact aerobic exercises and strength training. Walking is always the perfect exercise, and Pilates and a gentle yoga program are recommended for thyroid health as well.